Recorded November 16 and 17, 2011 at ‘Studio Eleven’, Hilversum, The Netherlands. Mixed and mastered November, December 2011 and March 2012. Recorded by Frans de Rond. Produced by Peter Bjørnild. Mixed and mastered by Frans de Rond and Peter Bjørnild. 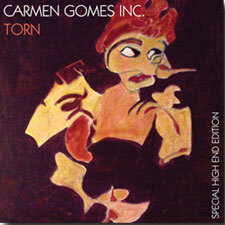 Arrangements by Carmen Gomes Inc. Cover painting by Kirsten Bjornild. Art design by Disselconcepts. Photography by Vincent Carmiggelt. Executive producer: Carmen Gomes. Carmen Gomes Inc. on Byton World Series: ‘Callin’ from K.C.’ BY951018, ‘Heaven is a State of Mind’ BY971019, ‘Gazing at the Sun’ BY991021, ‘Gotta Get’ BY011022, ‘Dreams’ BY021024, ‘Shades’ BY041027, NU BY061032, on CFMusic: Desire Cgi2010. Piet Dissel, Vincent Carmiggelt, Frans de Rond, Kirsten Bjornild, Ben Gomes, Nel Volkers, Marcel van Engelen, Peter Bjørnild, Folker Tettero, Frank Meijer, Rupert Neve Design, sE Electronics, you, my fans, friends and family for inspiration, fun, love to you all.